Anyone who knows me or who reads this blog regularly knows that I struggle just a little bit with my weight. I like food a whole lot. I also like making food a whole lot, and my husband likes making food a whole lot. We like trying new foods and expanding our palates and tasting different wines, and…. Well, you get the picture. I also eat my feelings. I have lots of feelings. So this adds up to a whole lot of eating and a whole lot of food. I’ve dieted since I was 15. I’ve gained and lost the same 30 pounds many times in my life. I’ve lost weight with Weight Watchers, SlimFast, the Master Cleanse and just plain old common sense. None of these things are working for me right now. Okay, I’m skeptical too. It seems everyone these days has their own diet book. But I’m also intrigued. Writing has been a way into myself this last year. I’ve discovered that my creativity is heightened and I feel more fulfilled when I write. This was a huge surprise to me. I’ve always hated writing in the past. 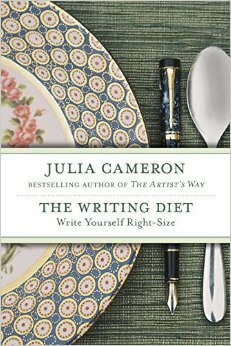 So why not try using writing to help break this cycle of weight loss and weight gain? It’s worth a try, right? The Four Questions – 1) Am I hungry?, 2) Is this what I feel like eating?, 3)Is this what I feel like eating now?, and 4)Is there something else I could eat instead? I’ve been doing my morning pages every day for six months, and yesterday I started my journal and a daily walking regimen. Will I keep with it? I don’t know. But I’m going to share my progress and obstacles with you here. I’m willing to give it a try. Anybody care to join me? Previous PostThe “C” WordNext PostHappy Coming Home Day, Murray!